I completed the last section of this challenge and made it out alive. Here you’ll find the last 3 challenges, as well as my thoughts on the whole exercise. Day 12: Describe a first. Your first kiss, your first kitten, your first day of school, something like that. What I wrote for this challenge constitutes an inside joke that only some old friends of mine would understand. So I won’t publish it or even include it here. But I will say that I tried something very similar to what I did for Challenge #7. And it only works if you know the situation. It was called Norman (402 words). So, the bottom line: It was fun to write but the result was of no value. The value was only in the exercise itself. My writing brain felt good afterwards. Day 13: Write a 600 word “conversation” in which no words are said. This exercise is meant to challenge you to work with gesture, body language, all the things we convey to each other without words. This one was fun. I thought writing a conversation that was just body language would be boring. I also didn’t want to do anything serious because of the word limitation. Besides, my brain immediately went to one specific idea: a customer interacting with a cashier by using the products he purchases as his method of communication. I like the premise and I like the result. I call it Swan and Phoenix, Beef and Ice Cream (657 words). And yes, I’ll be cleaning it up and attempting to publish it some day in the future. Day 14: Write a story backwards. The last challenge was pretty open ended. I wanted to stay away from something akin to film Memento, and try to put my own spin on this idea. So I took some liberties and instead of a story I wrote a poem. I had this idea for a poem that I was kicking around for years. Something that I would think about in free moments and wonder how exactly to articulate it. This was a great opportunity to get a draft down on paper. So that’s exactly what I did. I call it “Ice Cream Music”. I’m not usually a poet, but I really like the theme behind this one and the structure that the idea provides. This one you will hopefully see the light of day sooner rather than later. That was the last challenge! So what did I think of this exercise? Well, I finished and I have nearly a dozen works that I want to do something more with. By any measure that is a success. I would recommend anyone who is stuck for inspiration try something similar. I’m sure, if you looked, that you would find something in these or others to inspire your own art in some way. My only issue, and its a small one, is that the results of these exercises need a little more tender loving care than my other writing, which I take more time with. That means more editing, more rewriting, and more time on each story. So it will take a significant amount of time to work through these, get them where I want them and start the submitting process. But that’s at trade-off that may not be an issue for you. It wasn’t really for me. In my mind, anything that gets me putting pen to paper (or fingers to keyboard), is worth it simply because it engages my creative brain. And creativity is the only thing that separates us from the beasts. This was turning out to be an interesting activity. It was getting me in the mood to write more of my own stories, but I continued on with the challenge. Hopefully, the momentum I was building could be redirected elsewhere once the challenge was done. Day 9: Find two ads in a magazine or online. Create a poem only using words from the two ads. 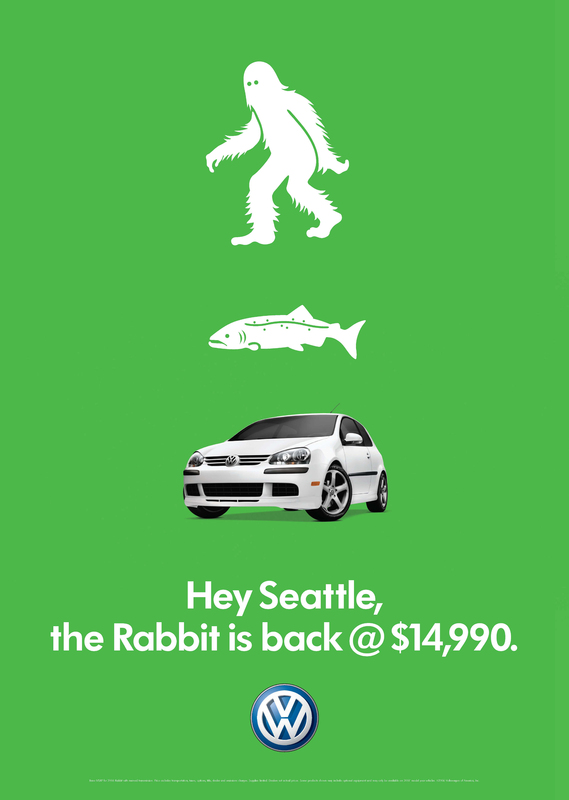 Hey Seattle, the rabbit is back at $14,990. VW. 100% Beef. What a whopper! Burger King. Not much to work with! I toyed around with a few ideas and ended up with two that I sort of liked. Hey, the Rabbit King is back! Rabbit King? What a whopper. The Rabbit King is 0% rabbit. Is the Burg King burger? $1 Burger King Whopper: 1% Beef, 0% rabbit, 99% WHAT?!?!? I found the whole process very gamist. Meaning, it felt more like a logic puzzle than a creative exercise. It was fun, though. Day 10: Write a 600-word first-person story in which you use the first person pronoun (“I” or “me” or “my”) only two times—but keep the “I” somehow important to the narrative you’re constructing. This one was very tough for some reason. I had written a story many years ago that started like this, and I was toying with the idea of re-writing it for this challenge. I was planning to do that anyway. Still, I couldn’t get in the mindset and instead came up with the below. A body is just sacks of fluid. Some sacks within other sacks, like Russian nesting dolls. Some just floating around by themselves like oil in a lava lamp. But all have a purpose: Life. But before life, there was nothing. My organs just sat there, limp, desiccated and empty like deflated balloons. The sack of skin they were housed in hung flaccid on a hook like a wrinkled old suit. Then, there was a filling. The nerves weren’t yet working, but they twitched with the sensation of pressure, slowly coming to life. With the introduction of fluid, the dried organic matter began to soak in nutrients like a parched desert, and then began to warm. Warmth! A sensation the nerves had never felt before but somehow knew was right. The body, growing now, was remembering. Not through electrical brain impulses, those were far off, but with something more base than that. Proteins and chemicals falling into their natural states like the keys of an ancient machine locking into place. And like the memory of heat, they had memories or impressions of what was supposed to be. And the metal hook in the back of the neck was not supposed to be. Neither were the dozens of inorganic tubes connecting the insides to the outsides. They were not like the organic frame everything attached to. That felt like it belonged. Like the slowly inflating flesh was hugging a loved one. Hugging tighter and tighter as the filling continued. So tight that they were becoming one. Flesh and bone. Bone and flesh. And they were both rejecting the sensation of the things that did not belong. Cold metal and plastic shoved in between the shelves of flesh. As if all at once the muscles soaked up enough of the fluid to spasm. The body twitched all over, as if testing its new-found ability. But the twitches were again automatic. A response of the flesh. A rejection of the not-flesh. The spasming continued, as the flow of fluid slowed down to a trickle and then to nothing at all. The body was full. All the pieces were there. There was only the final leap from pile of organic material to something more. The spasming of the muscles continued, which strained the flesh where it attached the non-flesh. That straining of proteins and cells just born falling into death, caused sparks. The nerves, now in place, surrounded by pulsating muscles, warm and free and suddenly aware of something else happening. Those sparks of dying and injured cells. The nerves came alive. They felt. They fired out commands, not knowing what or how. Just knowing that they had to react. And the flesh, it acted. And the nerves, they remembered. They remembered where to direct their tiny electrical charges. How to move the flesh. How to make it do what it wanted. Pieces started to fall into place. A machine of flesh. All those sacks of fluid, all those valves and pipes and hunks of stringy muscle had a purpose. And the nerves were giving the orders. And right now, they gave the order to escape. The limbs of flesh reached and yanked. The body twisted and jerked and soon the thing was free. The nerves made the legs move. Tentative wobbly steps. It shambled forward, fluids leaking out of its wounds, feet slapping wetly on the floor. It was aware. It was alive. That, little children, was the day I was born. Day 11: Start a paragraph with, “I remember…” and let your memories dictate what you write. I remember how it was before the water became too hot to walk through. I know it isn’t based on my own memories, but I just ran with it anyway. It turned into a pretty interesting piece. By itself, there are a lot of blanks in the story, setting and characters. Someday I might expand it into a larger work that fills those in. So, yes, this is another one you won’t be able to read for awhile. That is it for Part 3 of the 14 Day Writing Challenge. Stay tuned for the last 3 days of challenges and my thoughts on the whole experience. Just because I didn’t post about it doesn’t mean it didn’t happen! The 14 Day Writing Challenge continued, but the writing about the writing challenge did not. So I’m correcting that now with this recap of Days 3 through 8. Day 3: Write a fairly long, complicated phone conversation overheard by someone in the room. All three people—the listener in the room, the caller, and the person on the other end of the line—are involved with each other in some way (not necessarily romantically). Let us hear the other end of the conversation, without actually hearing it. This means you will be giving us only one side of a conversation. The listener in the room can guess what the person on the other end of the line is saying, but try to keep this guessing to a minimum, and make sure this guesswork is done with integrity—well after the unheard speaker has spoken. Again, this exercise produced a story that I was very happy with: Chad’s Mustache (923 words). I tried to use the concept to show that getting half the picture isn’t always enough to know what is going on. You can read between the lines, but don’t jump to conclusions. I think it’s a funny story and I’ll polish it up and send it out for publication soon. Day 4: Go sit in a public place and eavesdrop on a conversation. Turn what you hear into a short love story. I turned that into a small vignette between a clerk and a customer: The Navigator (839 words). Again, I quite like this one. It gave me the opportunity to make up fake band and albums names. Which is always fun. I won’t share this one yet because, as above, I’ll be polishing it and submitting it for publication. Day 5: Open the dictionary to a random page. Find a word that you do not know how to define. Write an imaginary definition for it. Repeat 4 more times. Maxixe: The portion of the sun that peaks over the horizon during a sunset. Indurate: Disobeying authority by pretending to misunderstand the authority-holder. Pooks: A game where one tries to throw Popsicle sticks into an empty tin can for nickels. Day 6: Select a book on your shelf and pick two chapters at random. Take the first line of one chapter and the last line of the other chapter and write a short story (no more than 1000 words) using those as bookends to your story. My avatar slowly materialized in front of the control panel in my stronghold’s command center, the same spot where I’d been sitting the night before, engaged in my evening ritual of staring blankly at the Quatrain until I drifted off to sleep and the system logged me out. No matter how hard I tried to focus my mind kept drifting back to Art3mis. My god! I thought I bit off more than I could chew. But it was kind of fun trying to get that first one to develop into a unique story and meander its way towards the second one. Again, amazingly, I was happy with the story and will attempt to publish it soon. It’s called Traditional Human Gifts (1,307 words) and it’s about a man who is forced to babysit an intelligent computer that has taken over the world. Day 7: Write a story in which a character has an experience that causes her to recall a startlingly similar past experience. Juxtapose the two scenes, the present one and the past one, on top of each other, writing, for instance, two or three sentences of the present moment, then alternating back and forth between present and past that way. Show the reader the remembered scene by use of Italics. This was another fun exercise that turned into a story I quite liked. It reminds me of one of those strange stories from Bentley Little that are just a litany of weird things happening. But that’s the fun of it. Once I came up with an idea that satisfied the challenge requirements, it just flowed. This is another one I won’t be sharing here. It’s called Q+A (752 words). Day 8: Find a world map and blindly put your finger on a spot. Then pretend you’re a travel writer and write about a weird experience you had in that particular country. I randomly pointed to the Pacific Ocean first, after that I pointed to somewhere in the middle of nowhere in Australia. I did some research and came up with a story I call A Traveller’s Guide to Thalanyji (599 words). It’s written in the style of a travel review for a remote village. I like it so much I won’t post it here! Do you see a pattern? Maybe I am just too in love with myself to realize the faults of the work. Well, I know that’s not true. My work is full of faults. I recognize those faults, but I love my work enough to get rid of them. After too long away from creative work due to personal reasons, I needed something to reinvigorate my brain. Thankfully, a loved one noticed what I needed and put together a 14 day writing challenge to get me back into my sweet spot. I plan to post about them here as I go, and hopefully share some of what I wrote with you. Maybe you’ll find some of these challenges worthwhile. If you do (or if you don’t), let me know and we can compare notes. I just finished day two, and am having fun so far. Day 1: Turn on your TV. Write down the first line that you hear and write a story based on it. Not having cable, I put a random Twitch channel on my PC and the first line that I heard was “60 seconds remaining”. I quite like the story I wrote (the last minute of a man aboard a self-destructing space ship) so I won’t be posting it on this site as of yet. Another draft or two and some editing and I’ll try submitting it for publication. Day 2: Find the 7th book from your bookshelf. Open it up to page 7. Look at the 7th sentence on the page. Begin a poem that begins with that sentence and limit the length to 7 lines. To be polite, Chirkov said he would consider the acquisition: evidently a great bargain. Not the best first line to a poem, for sure. I used it verbatim originally but below I used some creative license to lop off the first few words. The rest of the poem is unchanged from what I originally wrote. Well, poetry is not my strong-suit, but it was fun to try to write something that worked. More challenges to come over the next few days!